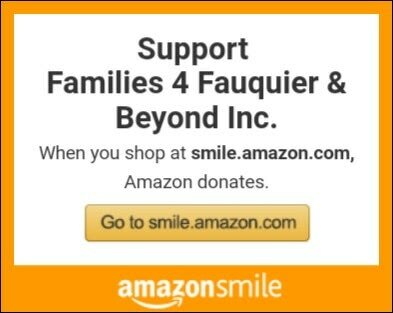 Families 4 Fauquier & Beyond, Inc. was incorporated as a nonprofit in Virginia on April 21, 2011. We currently rely on the generosity of local businesses, individual donors and our small fundraising efforts to support our projects, programs and community events to better serve our community. We are an official 501(c)3 (not-for-profit) charity organization. Donations are tax deductible. Click for a list of items that you could donate.